power meter and test results are recorded on the instruction sheet. towards the +100mW total of 532nm. I just got my 2nd over-powered 100mW green laser point from Jack. I've lost count but I think this is my 4th pointer from Optotronics since 2009. I originally started out with the 55mW and worked my way up to the 150mW as I needed my fix for more green beam. I never ever had a single issue with any of the pointers except for all the attention I got whenever I turned one on. Six years ago I purchased the 150mW and it still rockin'. This is my 2nd 100mW but not because the first one broke. It's because I would just kept selling one to get the next level until I was up to the 150mW. My father-in-law fell in love with it, so I gave it to him as a birthday present a couple years ago. Nice son-in-law move but that left me without a pointer and have been itching to get another one ever since. Absolutely lived up to my expectations. After hours and hours of research I ended up at Optotronics. If you're wondering whether or not your in the right place for the highest quality laser pen for the money, look no further. 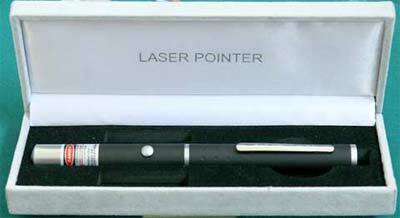 If it isn't enough that these laser pens are top notch the customer service is unequaled. I ordered a 55mW originally and then had second thoughts, thinking that I might have wanted a more powerful pen. I sent a question to the customer service email and within a couple of hours (this was at night), the infamous Jack responded and gave me the information I needed to decide I wanted the 100mW laser. He coached me through the best way to cancel my previous order and order the 100mW laser. He shipped the item out the next day (Saturday!) and it was in my mailbox on Monday. Oh, and by the way can I just say Wow! This laser is phenomenal. Build quality is solid, the beam is tight, clean and super bright. The hand signed test result of the laser is the icing on the cake. Thanks again Jack, I can't thank you enough. This laser is everything i wanted. i put the batteries in, and pushed the button... then i started giggling at how amazing this thing is. i went outside and it points all the way to the stars. you can see the beam crystal clear the whole way to the star. Optotronics, you have my business for life.